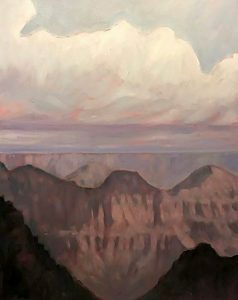 The UA Gallery will feature the work of Richard Richards in an exhibition of paintings, Tinted Grounds, February 1-23, 2019. The public is invited to an opening reception on Friday, February 1st (First Friday), 5-8 p.m. “Tinted Grounds” refers to the underpainting and backgrounds Richards uses in his work. “Painters have long used tinted grounds, at least since the Italian Renaissance, but typically they have restricted the grounds to earth tones. While this can help produce a color coherence, we might wish for something brighter, livelier and more intense. So we can instead use a more intense color and let it “pierce” or “bleed” through the top layers of paint, lending an overall coherence to the colors and generating dynamic color interactions at their points of contact. This can sometimes be surprising or unexpected given what is being represented,” Richards says of his approach in making his work. Richard Richards, professor and chair of The University of Alabama Department of Philosophy, has served as artist-in-residence at Yosemite National Park (1990-1991), exhibited artwork as part of the Arts-in-Embassies program and has been represented by commercial galleries in Washington D.C.; Jackson Hole, Wyo. ; and Park City and Salt Lake City, Utah. Richards’ philosophical research focuses on aesthetics and the history and philosophy of biology. He has just finished his third book with Cambridge University Press, The Biology of Art, which is currently in-press. Prior to his graduate study in philosophy at Johns Hopkins University, he was a professional ballet dancer, performing with major companies in Europe and the United States. The University of Alabama Gallery is located at Dinah Washington Cultural Arts Center, 620 Greensboro Avenue, Tuscaloosa, AL 35401. Hours are Monday through Friday, 9 a.m.- 5 p.m. and Noon to 8 p.m. on First Fridays of the month. Closed Saturday and Sunday. For more information about the exhibition, contact Daniel White, gallery director at (205) 342-2060.